I love nothing more than a good kitchen. It is always the heart of every home, and big or small, it seems to be the place where everyone gathers at a dinner party! Some of the best conversations I have with our house guests are always over a cup of coffee at the kitchen table early in the morning. 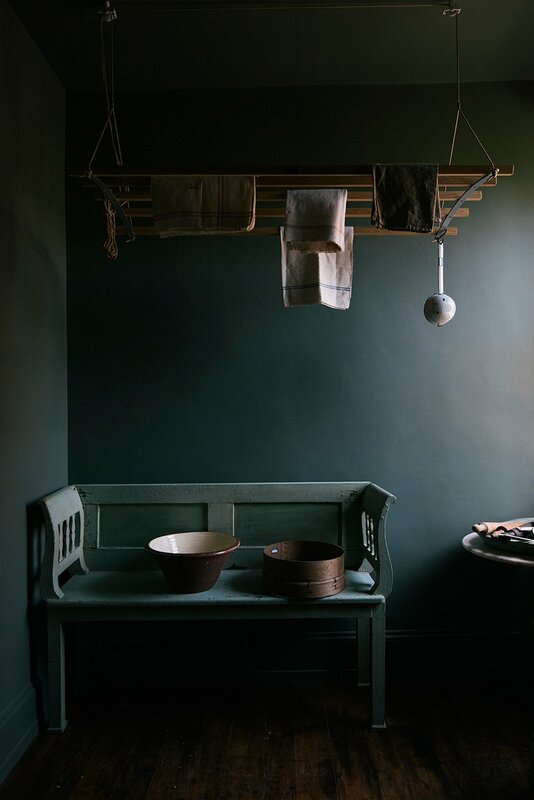 It really is my favorite room of a home, and that is why I have to share with you this amazing company called deVol. They make the most divine kitchens! Philip deVries and Paul O’Leary (de-VOL) first opened up shop together in 1989, renting a small workshop for their custom furniture and antique restoration. Now, almost twenty years later, their work has grown into a thriving design-led custom fabrication firm that is changing the landscape of British manufacturing for the better. They may not be a heritage brand, but they certainly have proven they will be here for the long run with their impressive list of clientele and ever-growing collections of finely made furniture and fabricated pieces for the home. A COUNTRY TAKE ON THE LONDON SHOWROOM. 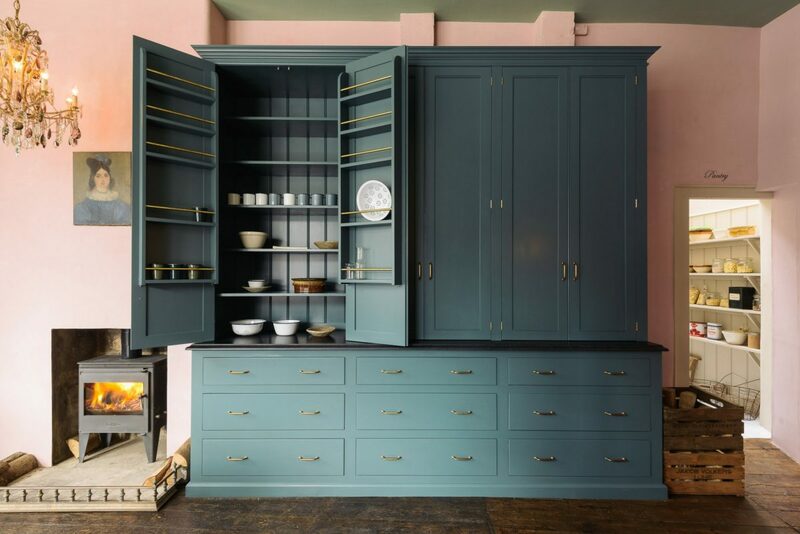 I first knew deVOL for their namesake kitchens, and it was love at first sight when I came across the finely carved millwork, perfectly fitted hardware, and sumptuously painted cabinets. 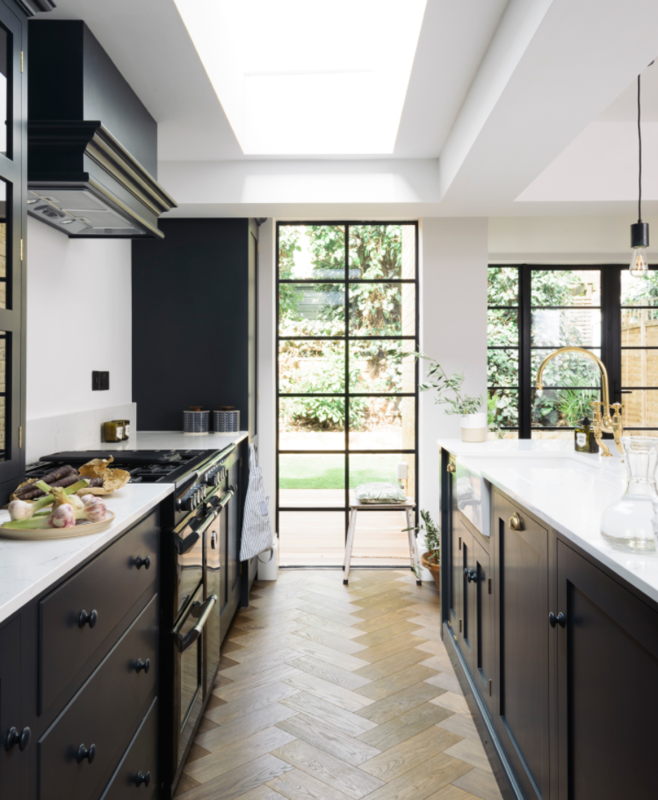 They certainly have a knack for using warm, muted colors with pops of brass and sleek details, which gives the overall kitchens a feeling of old British charm with a chic, contemporary edge. FARMHOUSE CHIC IN THE COTES MILL SHOWROOM. 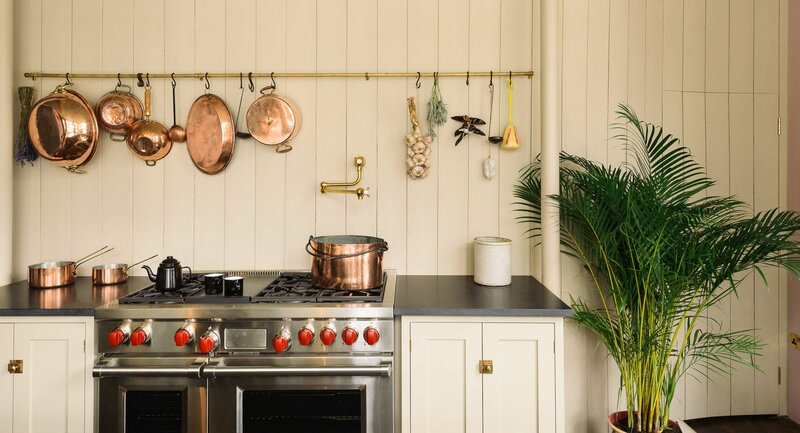 I LOVE THE COPPER POTS WITH THE BRASS DETAILS. 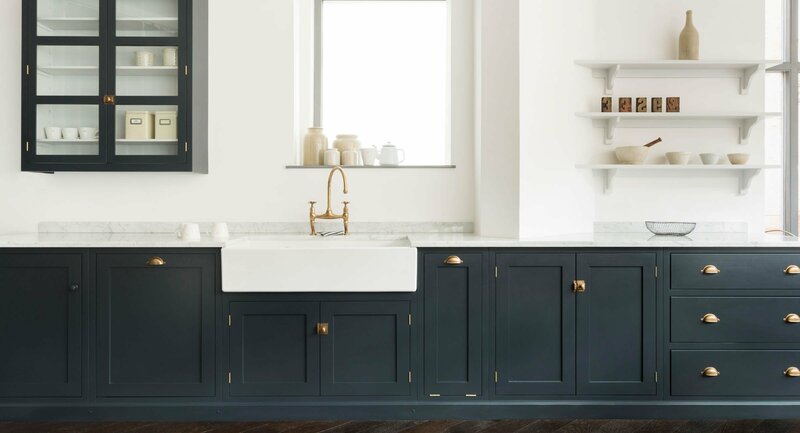 But what I love almost as much as the pieces themselves, is that deVOL is committed to this perfectly tuned style throughout their entire brand. 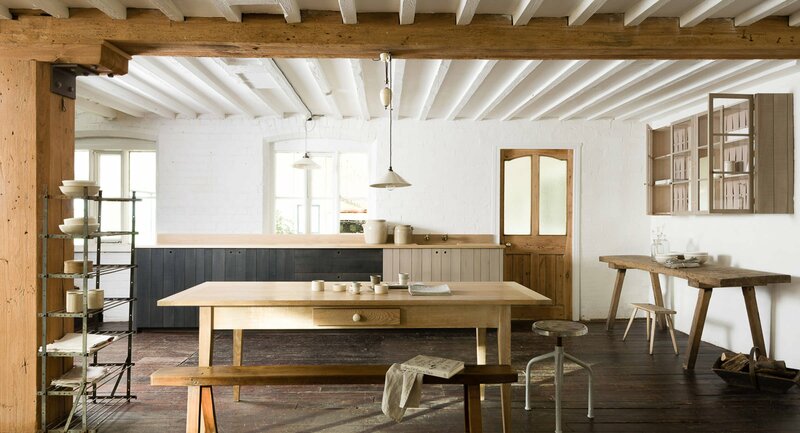 In 2012, after having set up showrooms and workshops in Loughborough (where the pair originally met at university), deVOL purchased Cotes Mill, a historic 16th century water mill on the banks of the River Soar. Here they worked to transform the beautiful property into a living representation of their fabulous style. With four floors of showrooms, on-site workshops and acres upon acres of beautiful surrounding landscape, you truly get lost in the lovely vision of the creative team. OBSESSED WITH THESE HERRINGBONE FLOORS. WELL, OBSESSED WITH ALL OF IT ACTUALLY! YES, THEY DO WASHROOMS TOO! 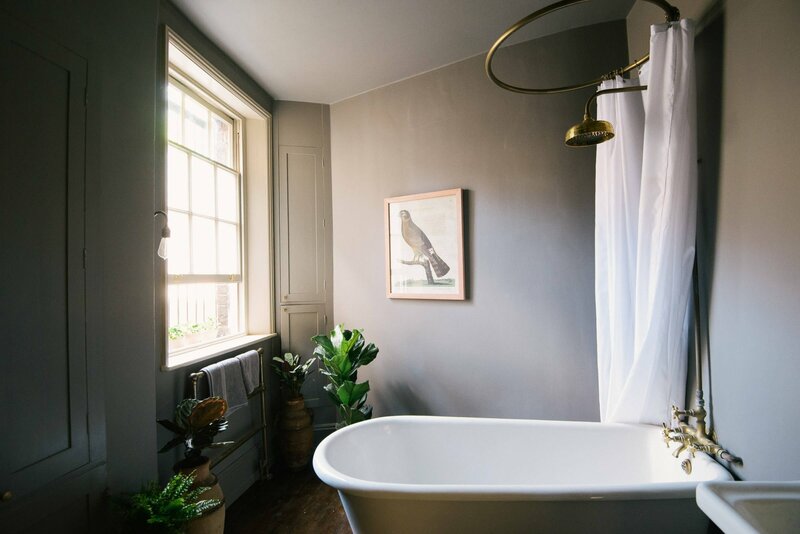 But if you can’t make it out to Loughborough, there are now two showrooms in London as well, that take all of the charm of the sprawling country campus and edit it down for the urban landscape. Hardly anything is lost though! Keeping with the designers’ roots in antiques, the showrooms are perfectly curated with vintage and restored pieces to make each installation feel like a home, not just a demo room. 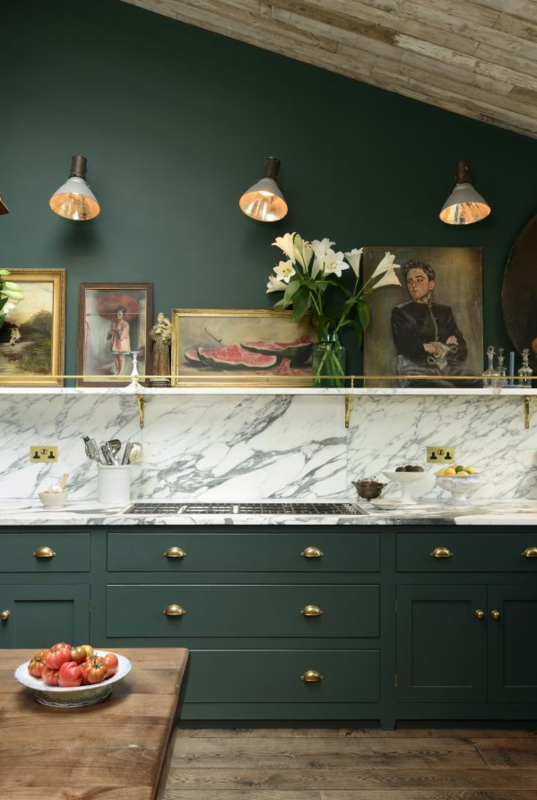 Which is why deVOL is definitely on my must-see list for London! Entering these showrooms is like getting a behind the scenes peek into that most stylish friend’s home, except you too can have it! 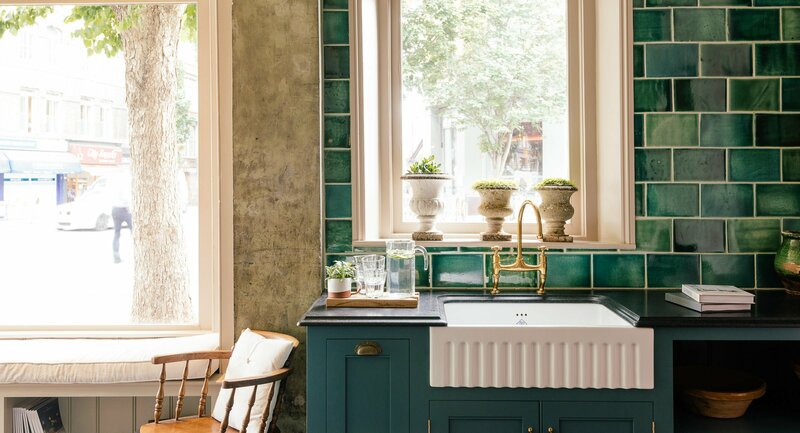 LOVING EVERYTHING ABOUT THIS COLOR SCHEME.